In the 1930s and the terrible housing conditions in the area began to ignite discontent and collective action. Much of the grassroots work organizing tenants at this time was alter claimed to originate with members of the Communist Party (CP), who were strong and active in the area at the time – but members of the Labour Party and other activists were also involved. In 1938-9 the struggle became huge, as mass rent strikes were organized in the borough of Stepney, which then included this area. The CP were heavily involved, and a useful short account of the rent strikes can be found in Phil Piratin’s book, Our Flag Stays Red. Piratin was a local CP member, who later became a CP councillor and MP. Two years of organizing among tenants in various streets and blocks came to fruition with rent strikes that erupted in 1938. Between August 1938 and mid-1939, tenants organized, refused to pay rent, and physically resisted violent eviction attempts. In the autumn of 1937 the Stepney Tenants’ Defence League was established… and began to deal with the individual rent and repair problems of hundreds of tenants… Tenants’ Committees were set up in blocks of buildings and streets. The individual issues of the tenants were dealt with by the Tenants’ Committee, acting as a kind of shop stewards’ committee and dealing direct with the landlord. The tenants were gradually gaining confidence and organisational ability ready for the big struggles ahead. The actions varied. The tenants were organised and formulated their demands. All kinds of repairs and decorations were specified, and reductions in rents were demanded. The rents varied considerably, particularly between controlled and decontrolled houses. The law defining controlled houses was incomprehensible to the tenants, and the landlords did not hesitate to take advantage of this to defraud them. Irrespective, however, of the law, demands were made for reductions of the decontrolled to the level of the controlled rents. In some cases… the fight was bitter. The Brunswick Buildings tenants were out on strike for eleven weeks. 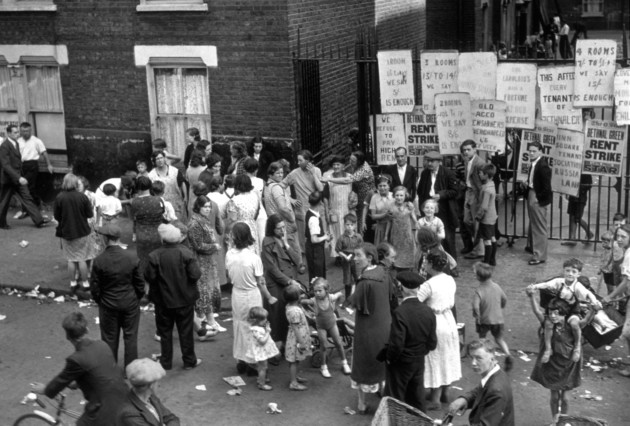 Langdale Street Buildings and Brady Street Mansions, both owned by slum landlords, were on strike for five months. These latter battles were particularly fierce. The landlords were firm and brazen. They refused to negotiate and after a while issued eviction orders to some of the most active tenants. The battle now began in earnest. Barbed-wire barricades were placed around the entire blocks. Pickets were on duty day and night. Only those who lived in the buildings, or could give reason for entering, or who were known tradesmen, were allowed to enter. One day in June the bailiffs, with the police, decided to act. They managed to gain access into Langdale Mansions. The alarm was sounded. The police drew their truncheons. The men and women of the buildings defended themselves with saucepans, rolling-pins, sticks, and shovels. The police were brutal, particularly in their treatment of the women. A cordon was placed round the building. More police, a score of them mounted, were called up. They broke open the doors and forcibly removed the tenants. By the end of the morning the news had spread throughout Stepney. The police, using the dirty tactics not unknown in Stepney, waited until the men had gone to work, and then attacked the women…. The men-folk left their work to come home… Some workshops closed down. Thousands of angry Stepney people gathered round Langdale Mansions. The police. sensing the feeling. withdrew. Immediately. the Stepney Tenants’ Defence League loudspeaker van toured the area. calling a meeting… When the meeting ended they marched to the Leman Street Police Station to protest… There was some rough scuffling. A number of arrests were made… the Stepney Tenants’ Defence League, immediately issued a statement that the 7500 members of the League would join in a solidarity strike with the Langdale Mansions and Brady Street Mansions tenants, unless their demands were met. The tenants themselves were now filled with indignation, bitterness, and hatred of all who supported the landlords. Messages of sympathy came from many prominent citizens and leaders of the Labour movement… by Friday of the same week the landlords had caved in: £1,000 worth of reductions were obtained; £10.000 worth of arrears were ignored; £2.500 to he spent on repairs immediately. £1,500 each succeeding year. The twenty-one weeks’ rent strike, bitter, bloody, had been won. Other landlords wishing to avoid trouble now became quite amenable. They, too, had learnt the lesson of Langdale Mansions. These struggles became front-page news. In March a conference had been held in Stepney of representatives of London organisations and delegates from the Labour movement to decide on the co-ordination of the London tenants’ struggles. Now the National Tenants’ Federation began to organise a nation-wide convention. It was to be held in Birmingham in July, when representatives of every town and city in the country were to demand a new code for tenants and residents, a new Rent Act, and new standards of conditions to be provided by the landlords. A ” Housing Charter” was drawn up, and a campaign begun. Labour leaders were drawn into the struggle. At the great demonstration held in Hyde Park late in July the speakers included Aneurin Bevan and Ellen Wilkinson of the Labour Party, and Elsie Borders. Michael Shapiro. and Tubby Rosen of the Communist Party. It was the latter who had done the work and the organisation, who had faced the bailiffs and the batons. Bevan and Wilkinson, as usual, were responding to the mood of the masses. The campaign was reaching its height, even during these menacing pre-war days and weeks. but then came the war and new problems had to be faced. Joe Jacobs, Out of the Ghetto.